Waggy Tails in Seahouses, near Alnwick, Northumberland sleeps 4 people. Waggy Tails near Alnwick is a welcoming, pet-friendly property located in the heart of the traditional fishing village of Seahouses. 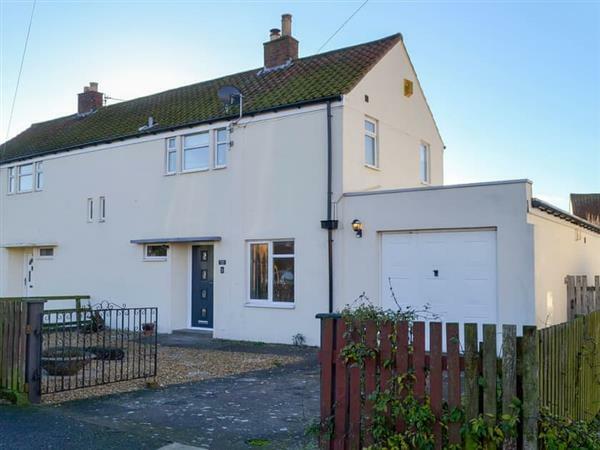 With two separate living rooms, both situated on the ground floor, this semi-detached property is deceptively spacious. The cosy sitting room leads to the kitchen, where on arrival, guests will find complimentary teas and coffee, and also giving direct access to a fully enclosed garden. The living room enjoys an open fire and leads to the main dining area where sliding patio doors enhances its bright and airy ambience. Both bedrooms are on the first floor along with the bathroom and convenient separate toilet. The main street of Seahouses is within easy walking distance where there is a small supermarket and a range of other local shops along with several places to eat. The golf course is on the links close by and horse riding can be arranged less than a mile inland. A gentle stroll brings you to the harbour where boat trips to the Farne Islands, famous for its puffins and seal colony, are a popular visitor attraction. Two miles south is the beautiful golden sands of Beadnell Bay, very popular with water sports enthusiasts, whilst 3 miles up the coastline is the picture perfect village of Bamburgh, and the dramatic castle is well worth a visit. A few miles inland is the historic market town of Alnwick where there are a wide array of amenities available. Waggy Tails is a perfect base from which to explore this beautiful 20-mile stretch of Heritage coastline recognised as an Area of Outstanding Natural Beauty. You have the beach ½ mile from Waggy Tails near Alnwick. With the shop, pub and restaurant 200 yards from Waggy Tails. Living/dining room: With open fire, Sky Q Smart TV (entertainment package), PlayStation 3, Wii and patio doors leading to garden. Sitting room: With electric fire, Freeview TV and double sofa bed (for flexible sleeping arrangements). Kitchen: With breakfast area, electric oven, ceramic hob, microwave, fridge/freezer, dishwasher and washing machine. Oil central heating, electricity, bed linen, towels and Wi-Fi included. Initial fuel for open fire included. Travel cot and highchair. Enclosed garden with garden furniture and barbeque. Bike store. Private parking for 1 car; additional on road parking. No smoking. Holidays at Waggy Tails run from Friday to Friday. Pets allowed at Waggy Tails. For a better idea of where Waggy Tails is, you can see Waggy Tails on the map below. Waggy Tails is in Northumberland; should you be on the lookout for a special offer, you can find all the special offers in Northumberland. It's always worth checking to see what is on offer at the moment. Do you want to holiday near Waggy Tails (UK3306), you can see other cottages within 25 miles of Waggy Tails; have a look to find your perfect holiday location.